BALTIMORE (Aug. 17, 2012) -- An increased focus on training and leader development can help commanders at all levels better understand the threat to America posed by adversaries in the cyber domain, said the commander of Army Cyber Command, during the Aug. 16 Armed Forces Communications and Electronics Association TechNet Land Forces East conference in Baltimore. "There is still more that can be done that causes leaders at all levels to understand and appreciate what it is going to take to operate and be able to conduct operations in land and cyber," said Lt. Gen. Rhett Hernandez, commander of ARCYBER. "I put a lot of energy into our exercise program." Lt. Gen. Rhett Hernandez, commander of ARCYBER, spoke Aug. 16, 2012, at the Armed Forces Communications and Electronics Association TechNet Land Forces East conference in Baltimore. "Once commanders are allowed to see and understand what it takes to plan for and integrate, and we unleash a world-class cyber [opposing force] on them, they now have the ability to recognize what they have to protect, what they can take risk in, and where we might have gaps in our training, or in our capabilities," Hernandez said. "That will improve our ability to conduct operations at those levels." "Every day at the tactical edge there is an absolute requirement to conduct operations that ensure that you are defending your network so you maintain the freedom to operate," Hernandez said. "That's not going to go away. What I believe will happen over time is we will have more convergence. We will train more as one team, and we will be able to bring cyberspace operations effects at all echelons, through all three lines of operations." Those lines of operations, Hernandez said, include "operate, defend, and when directed, conduct offensive operations." 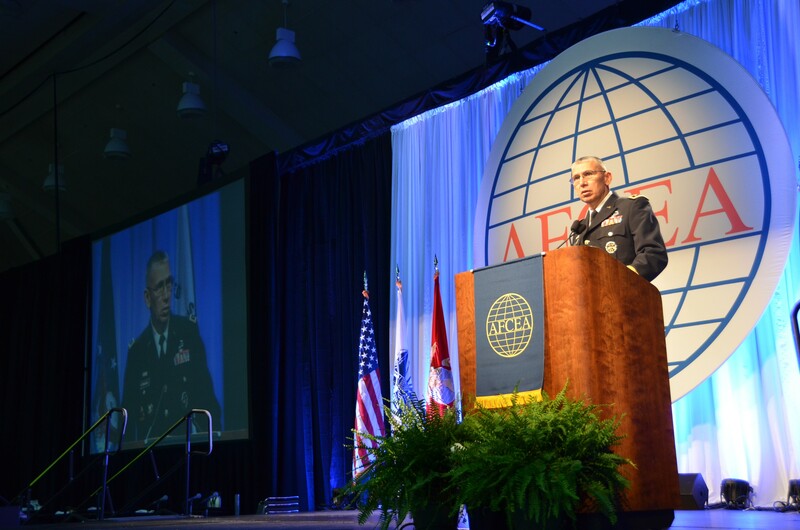 Mirroring the words of the Army's chief of staff, Gen. Ray Odierno, Hernandez presented to AFCEA conference attendees the roles of ARCYBER, in the cyber domain, in terms of the three roles that the chief has spelled out for the Army: prevent, shape and win. Hernandez said that the network, mobile networks and the social media networks have the ability to both shape the battle space and to prevent conflict in the first place, and that commanders must come to understand the influence of those networks on operations. "It is the social media that we all have a lot of work to do, and understand and appreciate it, because it is key to not only preventing but also shaping," Hernandez said. "We have seen from activities from around the world, particularly with the 'Arab Spring,' that it plays a significant role in winning." The general said the Army has "a lot of work to do" in determining how to include social media as an operational issue and not just as a public affairs issue, and must determine what needs to be done to "prepare ourselves for that social media environment that will be a part of, I believe, any future contests." With budget cuts on every Army commander's mind, Hernandez said the Army must be smart in how it prioritizes the threat in the cyber domain, and how it allocates limited funding to combat those threats. "What's on us is to ensure that we clearly articulate the most significant gaps and the requirements that need to be addressed -- are prioritized in a way that give us the biggest effect for the least amount of cost," Hernandez said. Hernandez said that DOD's plans for the "Joint Information Environment," which includes consolidated data centers, consolidated operations and management of network infrastructure, consolidated end-user services like e-mail, migration to cloud services, and standardization of hardware and software platform, are essential. Until the Joint Information Environment comes to fruition, he said the Army must focus on the essentials. "Absolutely essential to this is our ability to bridge the gap between now and then with only those things we have to absolutely invest in to mitigate the most significant vulnerabilities and risk to the network," Hernandez said. Additionally, he said, the Army must remain focused on research and development to stay abreast of rapidly changing technologies. The Army, he said must "remain committed to identifying and articulating the most significant science and technology requirements we need for the future, so that they are not surprises, but we are ahead of the threat and we are investing in the right R&D capability that will be there before we need it and not too late."